I began using cloth wipes with my second child. I cloth-diapered my first using disposable wipes for almost 2 years, and near the end of my pregnancy with my second, it occurred to me how frustrating it was to separate disposable wipes with reusable diapers! When I took the plunge, I was blown away: it wasn’t as bad as I thought, and it’s especially nice when you’re out, because EVERYTHING goes in the bag to be washed vs. needing to separate it when you get home. Game-changing! I dunno why I hadn’t thought of this sooner! It was also way less messy, and I didn’t need nearly as many wipes: 1 MAYBE 2 wipes per change! You can use anything for a cloth wipe. I started with some Buttons baby wipes that a friend gave me. You can cut up receiving blankets, old t-shirts, towels, anything. You can also buy some here, use an old wash cloth, again: literally anything. If you make them yourself, you might need to serge or sew around the edges to stop them from fraying. I bought a scrap of flannel in the remnants bin at JoAnn or Hancock Fabrics for a few bucks and cut them into 7-8″ squares, then sewed around the edge with a zigzag pattern using my sewing machine and whatever leftover thread I had. Nothing fancy, but super easy–your sewing doesn’t even need to be that straight! And, for the record, you don’t NEED to sew them, either. It helps make them thicker and stop fraying, but I’ve definitely got some that I was too lazy to sew and they get the job done just fine. Contrary to popular belief, you can actually use diaper cream with cloth diapers, but I found once I switched to cloth with a good wash routine that the need for diaper cream virtually went away, which was another added bonus! I found a diaper cream index here on Fluff Love’s site to be insanely useful because anything I had, or wanted to buy, was already on there. Zinc oxide is an extremely effective barrier cream that is safe on even newborn babies. There are many zinc oxide based creams out there that are cloth safe! The big thing is petroleum: that’s what’s not “cloth safe” about certain creams, so just read the ingredients. Some creams may stain (I don’t worry so much about staining, though, because like…diapers are for poop, and well, poop stains sometimes), and in that case a diaper liner can help. If I only have access to a diaper cream that isn’t “cloth safe,” I just use a liner like a paper towel or one of these. When in doubt, use a liner. Many moms prefer a food-grade coconut oil spooned out into a small shallow glass jar or dish they can use on their hands while changing. I don’t recommend this if you/your kid is allergic to coconuts or anything in that family, but it does make a great moisturizer barrier for most bums. And best of all, it washes clean in the laundry without any issue, so it’s totally cloth safe. Talc (talcum) powder is not recommended for use anymore (on cloth or other diapers) because it can be dangerous when inhaled or swallowed. As such, the recommendation is that you use it sparingly and put the powder on your hands before applying to the baby so that they do are not as likely to inhale any particles. Additionally, there is a lot of back-and-forth regarding the link between talc powder and ovarian cancer. However, it is effective in treating rash, so if you do use it, proceed with caution and do your own research. I am not a doctor! Most powders are safe for cloth diapers. The fear of powder I find is more about the babe, not the diaper. However, the diaper area is pretty far from their face, so I feel safe using powder on my babies knowing I am taking the necessary precautions to ensure they aren’t going to be inhaling it. Nobody likes a sore bottom, lease of all a baby who can’t tell you what’s wrong. Poor babe! Depending on the type of rash, a couple different solutions can be found. Though, I will say, rashes in cloth diapers with a good wash routine tend to be VERY rare. One of the main reasons I cloth diapered my second daughter was because she was allergic to EVERY disposable diaper. I tried no fewer than 8 brands and each one made her swollen and flaming red every inch of skin the diaper came into contact with! 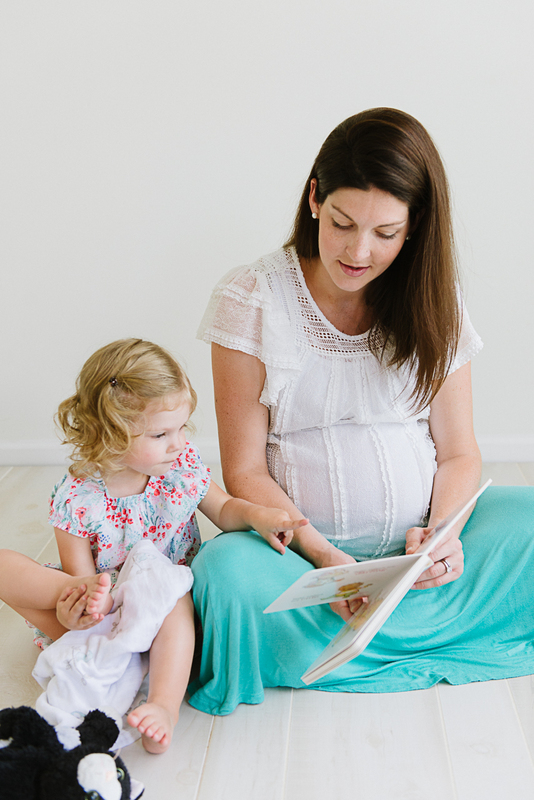 We finally did find a disposable brand that worked on her sensitive skin which we used for travel, but it was not feasibly cost effective to use daily when we already had the giant stash of cloth diapers leftover from my oldest! For general redness or irritation, a gentler wipe may be all you need. We use the Kirkland’s wipes from Costco when we can’t use cloth wipes, and have had no issues. Because our wash routine is very good, I know that any diaper rashes we may encounter are not chemical burns from detergent (which look like an actual burn) or irritation from ammonia build up (insufficiently cleaned diapers). For chafing, food reactions, friction from frequent wiping, or acidic fruit poops (#toddlers), a barrier cream for a day or so is usually enough to clear any redness. See above for the cloth-safe creams. A simple basic zinc oxide is usually enough! For a yeast rash, make sure you’re not using creams or ointments or powders that can be feeding yeast: avoid anything with a steroid (cortisone), cornstarch, etc. Yeast diaper rashes can be bumpy but usually look “beefy red:” shiny, red, occasionally satellite lesions can appear. Yeast likes warm, dark, moist, so often you find it in the rolls and folds of the baby’s skin. Yeast diaper rashes in a cloth diaper are not a death sentence! We use a topical antifungal (miconazole 2% or clotrimazole 1%) for about 10-14 days after the rash appears to be cleared, lots of air/sunlight time whenever possible, and change the diaper as often as possible (to avoid the skin/diaper sitting in dark, moist areas). Occasionally you may get a rash cultured and be prescribed a prescription cream — if that’s the case, use a diaper liner if you can. It’s also important to treat the diapers, too! I use this recommendation from Fluff Love, and it has NOT FAILED ME. My youngest had a stubborn yeast rash but once I followed these instructions WHILE treating her rash, our troubles went away. 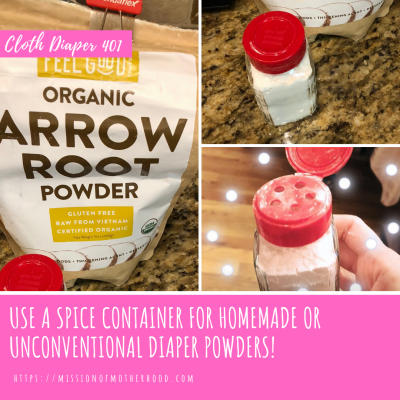 Follow the instructions for doing the bleach soak to disinfect the diapers (this will not ruin your diapers, even cotton ones, as long as you follow the directions! I have done other bleach soaks many times when buying or borrowing preloved cloth, and have had no issues with staining or fading). Then follow up per the instructions by adding bleach to your laundry routine for 14 days after the yeast rash is controlled. Whew! What did I miss? 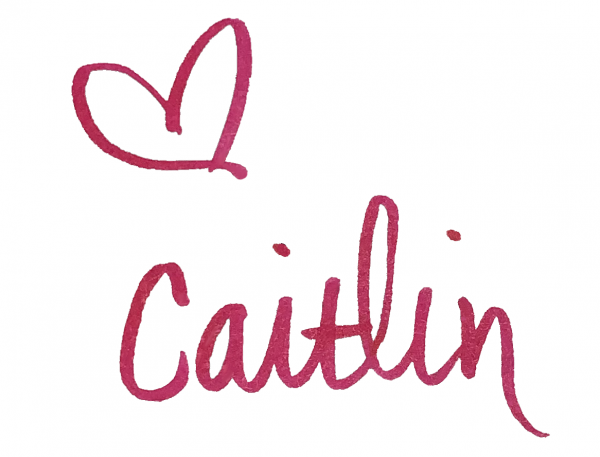 Any cloth diapering mamas out there have anything to add in the way of cloth diaper creams, powders, and rashes? 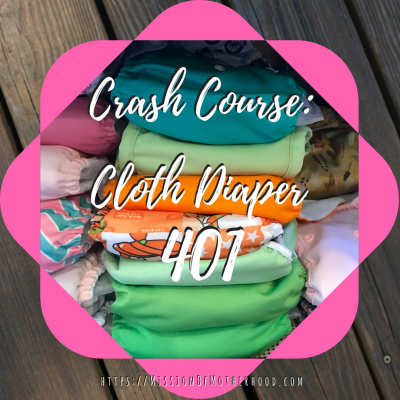 If so, leave a comment — I’d love for this to be a good resource for another cloth diapering family.